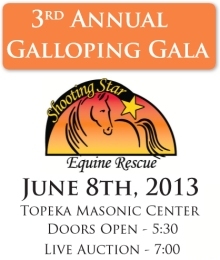 Toby’s Heart of Gold Fundraiser | Shooting Star Equine Rescue, Inc.
A clever idea was suggested to help raise the necessary $ 2,000 to cover the emergency care for our rescue colt, Toby-who so unexpectedly became critically ill with neurological symptoms and had to be euthanized at K-State on 4-1-13.. This was a devastating shock to all who had been involved in his blossoming over recent months into a big, handsome buckskin boy, full of love and life; so deserving of an incredible future. He arrived from animal control to the rescue in Oct. after he was found abandoned and injured, also suffering with a wormy stomach and horrible neglect. He immediately won the heart of everyone he met, for he was a “people horse”, who wanted to be right there with you-always finding a way to get special attention with his playful antics. He truly did have a “Heart of Gold”. The combination of the emergency Auburn Animal Vet bill and K-State’s bill for Toby’s intensive care is $ 2,000. As a small rescue reliant on public support for operation, Shooting Star is not financially able to cover this without the help of others who understand our need to give these horses the optimal medical care when a crisis arises. While we so wish the support was going to sustain Toby in his recovery, we instead remain responsible for these expenses after he lost his fight. We must raise the $ 2,000 to cover these bills. We still have close to 20 horses to provide care for each day and with many upcoming necessary expenses such as hay, medications, tractor repair and farrier work, we are worried. We now need the support of others more than ever and understand the difficulty in raising funds for a horse who is no longer alive. We are hopeful this fundraiser can offer a new option for those of you willing and able to help since we understand a monetary donation is not always possible.